Why should I choose this Training? We teach the full Primary Series of Ashtanga Yoga with emphasis on safe and effective hands-on adjustments to create a great experience for students. There aren't many Yoga Alliance Trainings that offer the powerful and profound Ashtanga Yoga practice in a teacher training. We have been doing so for many years and have created a strong pathway for our students to become amazing teachers. There will be plenty of "practice time" to allow you to hone your new-found teaching skills. We believe it's essential to prepare new teachers in feeling comfortable in front of a classroom once they leave our Training. Anatomy of Ashtanga Yoga is a balanced Teacher Training with plenty of asana and non-asana material including meditation, yoga philosophy, a months-long in-depth look into the energetic body, anatomy and physiology, Ayurveda and much more. You will go through a powerful personal journey in our Training...your own practice, whether on the mat or the large portion of life "off the mat" will be your greatest guide to becoming an effective instructor...and Shari will lead you well through our months together. Our staff of highly qualified and engaging instructors will make sure you are grounded in all of the subjects covered, and come away with a complete understanding of the information. Our 2 Weekend per month schedule allows for time between sessions to integrate the material covered and at the same time bring the benefits of an intensive training experience. To aid in deepening your personal practice, all of your yoga classes outside of the Teacher Training are included in the total cost...a savings of over $800! You will complete your 200 Hours with all the tools you need to step into the real world and share all that you've learned with a feeling of confidence, competence and heart! * Training satisfies all requirements for Yoga Alliance 200 Hour Certification. At the end of the Training you will be able to apply for RYT200 status. NEW FALL 2019-2020 TRAINING DATES COMING SOON! *Tuition covers unlimited classes at Sun Dog Yoga throughout the entire Training! There is a non-refundable deposit of $350 due to enroll in the training (this is included in the full tuition fee). You may pay the tuition in full or in seven installments of $350 beginning our first weekend in October, 2018 and ending in April, 2019 (payments due first weekend training of each month). Your tuition will cover all of your trainings and materials for these trainings, with the exception of the cost of a small number of books which will be required reading. 2. What do you hope to receive from the Training? 3. Tell us about your “yoga history”...how long have you been practicing, what style(s), with whom? 4. What is your intention in teaching yoga to others? IS that your intention? 6. Do you have any physical issues that might impact your experience in the training? Shari’s yoga journey began thirty years ago with the practice of Iyengar yoga, which proved a peaceful haven in a period of years spent as a freelance art director in Chicago. Shari followed her heart into the field of bodywork therapy, and subsequently became a yoga instructor. She was first introduced to Ashtanga yoga by Manju Jois, eldest son of S.K. Pattabhi Jois, and a new yoga love was forged. Shari has studied extensively with David Swenson, Nancy Gilgoff, David Williams, to name a few…all senior roots of the Ashtanga family tree. 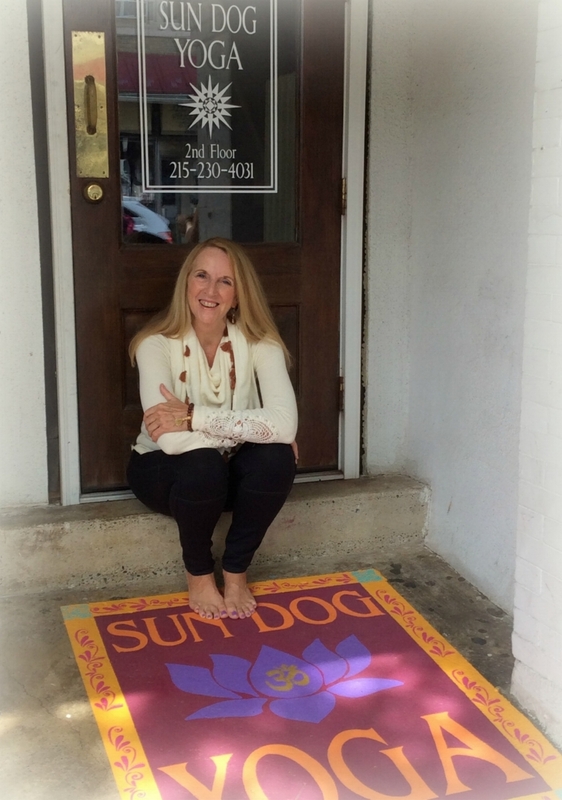 Shari opened Sun Dog Yoga Studio twelve years ago in Doylestown. Shari developed her first Yoga Teacher Course in 2000, training many of our local yoga instructors. Since then she has taught five groups at the 200 Hour Level of the Anatomy of Ashtanga Yoga (Yoga Alliance Certification) and three groups of the 300 Hour Advanced Training since 2014. Shari has been a practicing bodywork therapist for twenty five years, and this path of understanding the body on many levels greatly informs her abilities as a yoga teacher. Shari is Registered with the Yoga Alliance at the highest level (E-RYT 500, YACEP) She holds a Bachelor of Fine Arts from the University of Notre Dame.